UtahPresents hosts a season of collaborative and unconventional events. Thursday, Sept. 14, 7:30 p.m. Stage doors tend to attract uninvited groupies and fans seeking an autograph after a show. But with its new "Stagedoor" series, UtahPresents invites audience members right in. 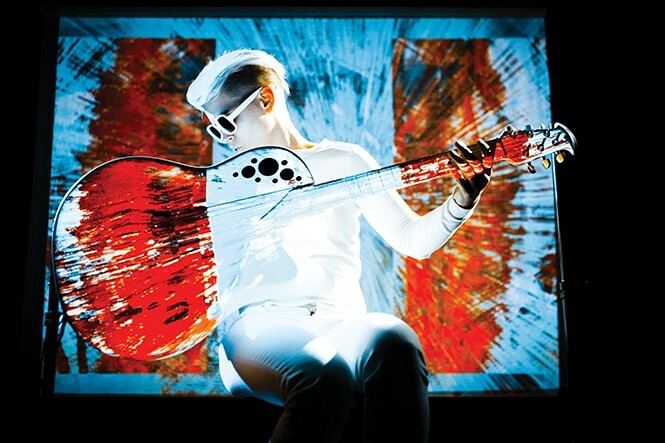 In fact, those at guitarist and composer Kaki King's Sept. 14 performance at Kingsbury Hall will be seated on stage with her. Brooke Horejsi, director of UtahPresents, says concepts like this one create an environment that's "intentionally intimate" and "less traditional." A self-defined connecter, Horejsi says she continually asks herself, "Who is in this community? And who in this community regularly doesn't get represented?" Thursday's event, The Neck is a Bridge to the Body, is also unconventional in other ways: King incorporates large-scale, often abstract digital projections with her music. It's one of UtahPresents' many offerings this season that highlight distinct and multidisciplinary performances. "When I curate a season, I'm thinking about how I'm making space in my programming for artists who identify in nonconventional ways," Horejsi says. "Their voices are just as important as a traditional ballet company or amazing violinist. The opportunity to experience the voices of a diversity of artists is what can make us, as audiences, better and more thoughtful community members and world citizens." Over the course of the 2017-2018 season, UtahPresents plans to showcase several performances with unconventional approaches, and which connect members of the arts community in unique ways. In November, the theater production White Rabbit, Red Rabbit invites eight individuals over the course of eight nights to perform a play that they'll see for the first time when they open an envelope containing the script an hour before showtime. February brings a performance by Doug Varone and Dancers which includes participation by members of Ririe-Woodbury Dance Co. and students from the University of Utah dance program. Horejsi is keenly aware of the diversity in Salt Lake City, and her programming includes a spectrum of artists and audiences. When Obie-winning performance artist and provocateur Taylor Mac appeared last season, Horejsi recalls, "People I had never met before were hugging me in the lobby and there was a literal avalanche of emails, texts and Facebook posts. Many said, 'We can't believe this artist was on stage at Kingsbury Hall because this part of our community hasn't traditionally been on that historic stage." Horejsi's vision is supported by a budget that comes from varied sources. "As a mission-driven presenter, focused on the positive impact of creativity in a community, the performances themselves are a revenue negative endeavor," she explains. The operating budget of UtahPresents is "a hair over $2 million," with income from private philanthropy, government grants, ticket revenue and the university, as well as a $16 per student annual fee. This fee enables students to see all of its offerings for $5 a show, and Horejsi believes that by requiring a small sum for UtahPresents' events, they are reinforcing the importance of the arts. "When we make all arts events free, it may send a message that they have no value," she says. "It trains generations of people to question the significance of art and artists." Other scheduled performances this season blur borders between artistic creation, education and activism. Ananya Dance Theatre (ADT), a Twin Cities-based, contemporary Indian-American dance company dedicated to social justice, comes to Salt Lake City for the first time on Oct. 28 with their performance Shyamali: Sprouting Words. Dr. Ananya Chatterjea, director of the company, was inspired in part by the work of author and activist Vandana Shiva, one of the founders of Navdanya, an India-based program that promotes biodiversity. On Oct. 20, Shiva is set to deliver a public lecture at Libby Gardner Hall, the first-ever collaboration between UtahPresents and the University of Utah's Sustainability Office. During the week before the performance, Ananya Dance Theatre will be in residence at the university to work with students from environmental and sustainability studies and the School of Dance. Chatterjea looks forward to bringing her company to the campus where she has been a guest artist. "I hope that the majestic mountains of Utah inspire us to connect individual and ecological differences and resonances." Liz Ivkovich—research, communication and education coordinator of the Sustainability Office—organized this collaboration and says she's grateful for Horejsi's enthusiasm. "She's such a 'yes' person. She said, 'Let's make it happen,'" Ivkovich says. It's just another example of UtahPresents' effective mission: "Exploring and enriching the human experience." Or, as Horejsi says, highlighting the "positive impact of creativity in a community."